Figure 1. 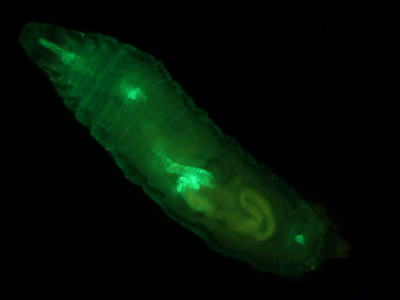 Non-mutant Drosophila melanogaster expressing GFP. © NIGHTSEA/Charles Mazel. Figure 2. 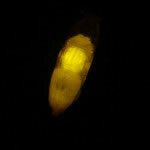 Larval sorting under ambient lighting. Figure 3. Students sort larvae using NIGHTSEA's SFA in Royal Blue. Dr. Reed now has shifts of two to four undergrads sorting in parallel. Dr. Laura Reed (Dept. 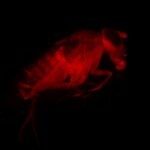 of Biological Sciences, University of Alabama, Tuscaloosa) heads a research program to investigate whether mutations in specific genes in fruit flies, Drosophila melanogaster, affect triglyceride storage. 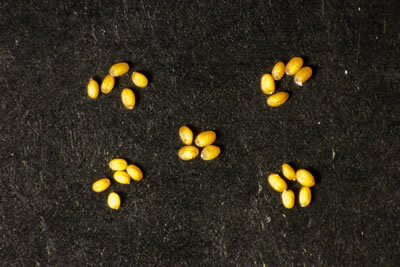 To gather sufficient material for analysis, Dr. Reed requires large numbers of larvae of each genotype. 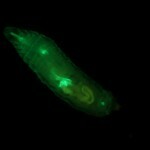 Her program involves testing 84 different genotypes and, for each genotype, 200 or more larvae. 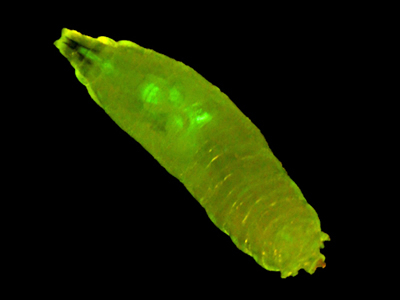 A special strain of fruit flies has been genetically engineered to express Green Fluorescent Protein (GFP) driven by an actin promoter (Figure 1). 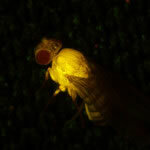 Only the flies without the mutations fluoresce. 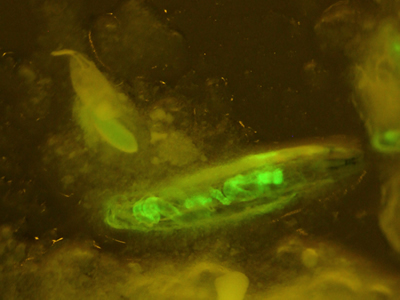 The clear difference between fluorescent and non-fluorescent larvae makes them easy to sort. 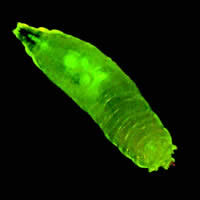 For best results, the larvae need to be collected, sorted, and frozen when at their largest, but before they pupate. However, they are at this stage for only about six hours. 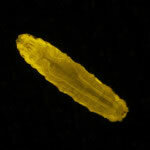 With 84 genotypes to test and 200+ larvae per genotype, sorting is a major challenge. 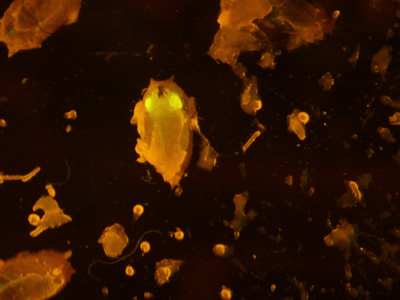 While Dr. Reed has a large pool of undergraduates available for sorting, the greater challenge was that she only had access to borrowed time on another lab's research fluorescence stereo microscope. 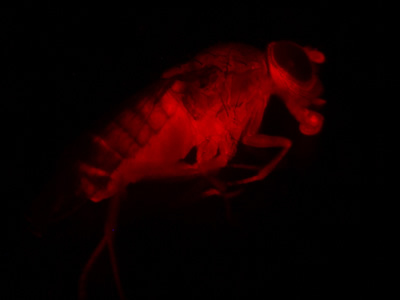 Dr. Reed visited the NIGHTSEA booth at the annual Drosophila Research Conference and tested the Stereo Microscope Fluorescence Adapter (SFA) system. She immediately realized the potential of putting both her undergraduates and four of her existing lab-grade stereo microscopes to work. The SFA provided a practical, economical solution for her limited equipment. 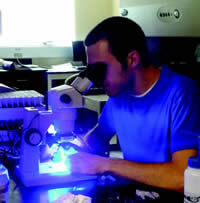 For Dr. Reed, "Royal Blue" provided excellent results (Figure 2, 3). 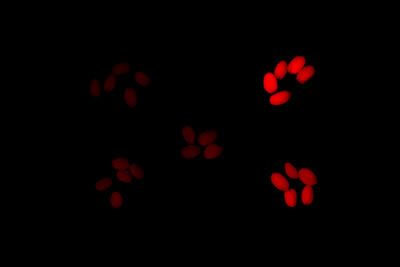 NIGHTSEA's Stereo Microscope Fluorescence Adapters offer a number of advantages. First, they require no modification to your existing microscope. 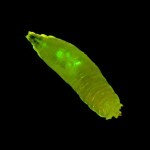 They just click into place, making them easy to use and easy to exchange, either on one microscope or between different microscopes in the lab. Secondly, SFAs are economical and expandable. 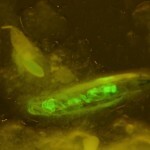 Since Dr. Reed currently works only with GFP (blue excitation / green fluorescence), she only needed to purchase one version of SFA. However, as the needs of her lab grow, additional sets can readily be added. 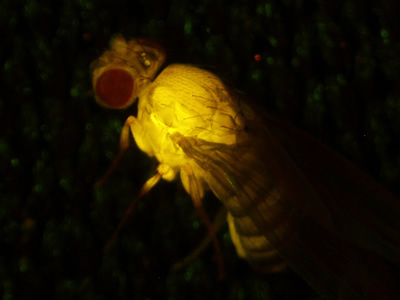 Finally, as demonstrated by Figure 2, SFA's bright illumination and excellent barrier filters allow many fluorescence experiments to be conducted under near-ambient lighting. In this case, the overhead lights were turned off and the blinds closed, but the room does not need to be in complete darkness. As for Dr. Reed? 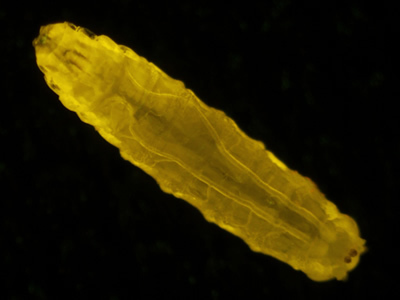 Using NIGHTSEA's SFA, she routinely has shifts of two to four undergrads at a time, sorting Drosophila larvae in parallel. 84 genotypes? 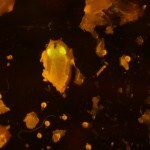 200 larvae per experiment? Problem solved! 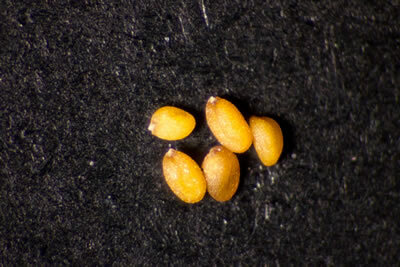 Arabidopsis thaliana is a small flowering plant that is widely used as a model organism for a variety of genetic studies. 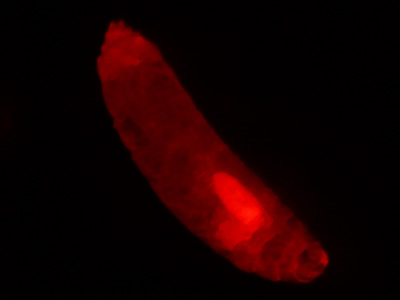 Dr. Scott Poethig and colleagues at the University of Pennsylvania have developed a novel transgenic strain of A. thaliana that has chromosomal segments with eGFP on one end and dsRed at the other. 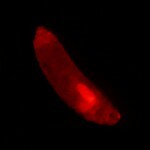 The segments can be followed in genetic crosses and manipulated via recombination. 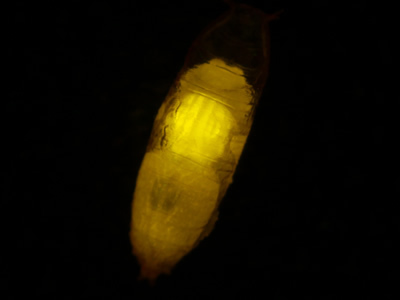 The transgenic strains will enable a variety of experiments, including phenotypic analyses of mutations with weak or environmentally sensitive phenotypes. They are intended for use in both research and education. 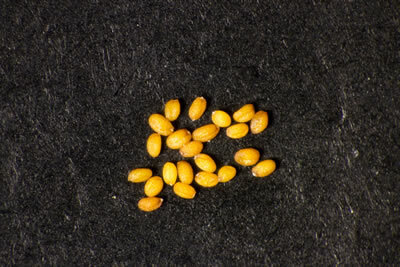 Dr. Poethig was looking for a cost-effective way to sort the genetically modified seeds in a teaching setting. 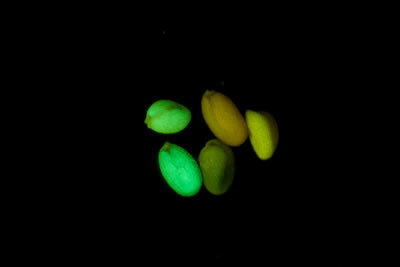 He learned about the new NIGHTSEA Stereo Microscope Fluorescence Adapter and sent a set of seeds for testing. 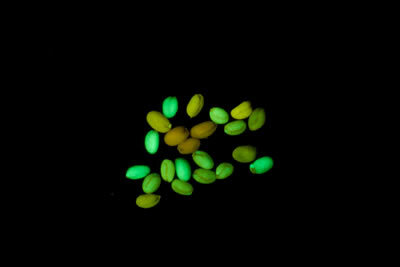 There were five varieties - strong and weak green fluorescence, strong and weak red fluorescence, and non-fluorescent control. 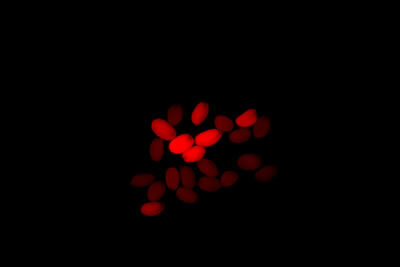 All of the variations were easy to see, even with the room lights on. 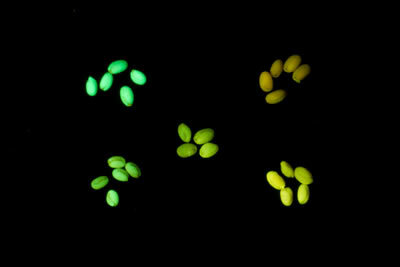 In each row the image on the left was taken with white light illumination, the image in the center with the Royal Blue excitation/emission combination, and the image on the right with the Green excitation/ emission combination. 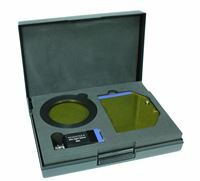 Equipment - NIGHTSEA Stereo Microscope Fluorescence Adapter, Motic SMZ168 trinocular stereo microscope, Canon EOS Rebel T2i camera.